Musical theater lovers may cry foul at the changes from the stage show, but for everyone else, “Into the Woods” is a clever and fun musical fairy tale romp. 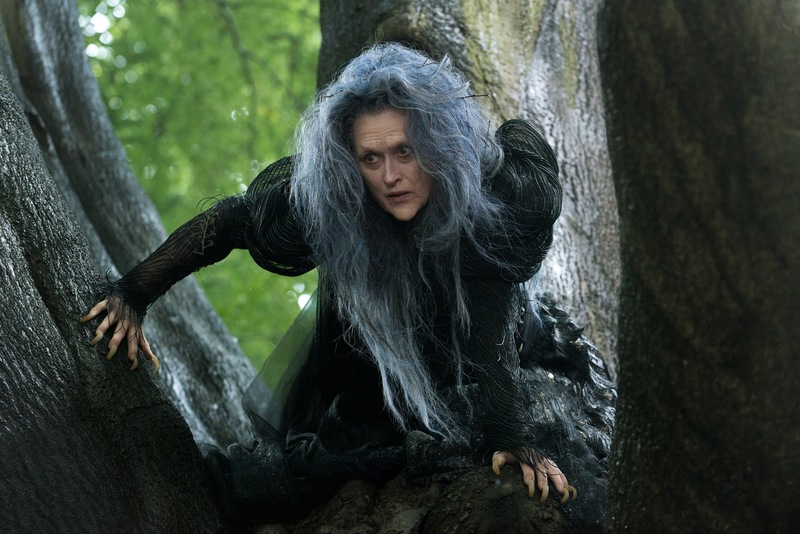 Musical theater aficionados and Stephen Sondheim fans may balk at the changes to be found in the long-awaited film adaptation of Into the Woods, but for everyone else willing to give it a chance, it’s a clever and fun musical romp that charms from start to finish thanks to a stellar ensemble cast led by Meryl Streep. 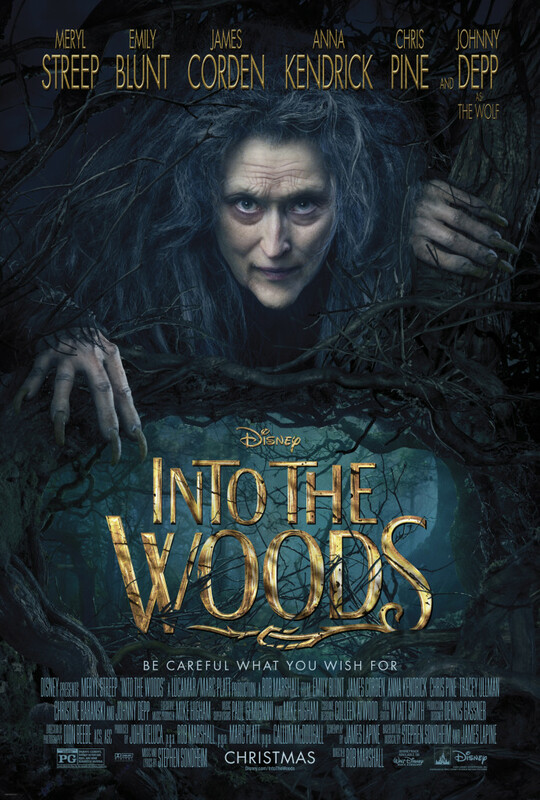 The setup for the film’s story is virtually identical to that of the stage show: Once upon a time in a faraway kingdom, a baker and his wife (James Corden and Emily Blunt) discover to their horror that the reason they have not been able to conceive a child is that their house has been cursed by a neighboring witch (Streep) for wrongs committed by the Baker’s father long ago. The witch offers to lift the curse, but only if the couple ventures into the nearby woods and brings her back four items within three nights’ time: a cow as white as milk, a cape as red as blood, hair as yellow as corn, and a slipper as pure as gold. Sounds easy enough, right? Well, the owners of said items might have something to say about it before they are parted from them. The owner of the cow, Jack (Daniel Huttlestone), needs to sell “Milky White” at market to bring back money for him and his mother (Tracey Ullman) to live on. She of the red cape, Little Red Riding Hood (Lila Crawford), off in the woods on her way to see Granny, wouldn’t dream of parting with the cloak her beloved grandmother gave her. The hair as yellow as corn is still very much attached to the princess Rapunzel (Mackenzie Mauzy), locked away in her tower in the woods but using that long hair to help her prince (Billy Magnussen) climb up to pay secret visits. And the slipper as pure as gold is part of the enchanted evening wear worn by Cinderella (Anna Kendrick) each night as she attends the Royal Family’s ball, only to flee from the arms of another prince (Chris Pine) who, utterly enthralled by her after they dance each of those nights away, chases her … where else? Into the woods. Everyone in the woods has a story and a crisis. Everyone in the woods is wishing for something more in their lives, something wondrous and magical. By the end of the show, pretty much everyone in the woods learns that they should be really careful what they wish for. In a time in Hollywood where film adaptations of popular musicals are a risky proposition at best, financially and critically speaking, bringing one of Broadway’s most beloved and well-regarded productions to the big screen brings with it a great deal of anticipation, hype, and expectation of failure. It’s a very good thing Walt Disney Pictures entrusted this effort to director Rob Marshall, who along with the show’s original book writer and director James Lapine delivers a version of the show that both honors the themes and ideas that characterized the source material and stands solidly as an accessible and enjoyable film. That is no mean feat: for every successful adaptation of a stage show into film over the past ten years — Les Misérables, Mamma Mia!, Dreamgirls, Hairspray, The Producers, and Rent — there’s at least one that fell flat and failed to deliver at the box office, bombs such as Jersey Boys, Rock of Ages, Sweeney Todd: The Demon Barber of Fleet Street and The Phantom of the Opera, among many others. The reasons for success versus failure among these film versions of profitable and well-remembered stage shows tends to vary, but one that’s more common than others is the choice of director and that director’s particular vision for the productions, as well as their skill set. Marshall, who back in 2002 turned Chicago into a box office sensation and a critical darling, shows once again that he has the right skill set to make a dynamic and complex musical production come to life on-screen in a way that maintains the stage show’s feel while not alienating the casual moviegoer to whom actors singing on-screen is a signal to get up and leave immediately. He for the most part keeps the pace moving fluidly, the choreography of the various musical numbers energetic and engaging, and his ensemble playing to their strengths. He even manages to deliver a surprise or two here in terms of his casting choices: for example, Streep showing off her command of this sort of material is no surprise after she was arguably the best thing about Mamma Mia!, but who knew Emily Blunt or Chris Pine could be this good in featured singing roles? As for the changes made to the show’s story for the sake of time and tone (this is Disney, after all), they are considerable, so be prepared if you know the various productions and revivals by heart. Overall, the film isn’t quite as bawdy and suggestive as the stage show, and not as dark in terms of the ends met by certain characters and resolutions of certain subplots. Curiously, despite the cuts, the film does tend to drag in the final act, particularly when the majority of the songs in the film’s final minutes are reprises of earlier songs. But if you’re willing to forgive the pacing issues and liberties taken, Into the Woods really is a great choice for a piece of solid entertainment to enjoy at the movies over Christmas. In fact, you can pretty much count on walking out of the film with at least one of the songs stuck in your head, and you’ll be happy to be singing it to yourself or whoever you saw the movie with all the way home. Starring Meryl Streep, Emily Blunt, James Corden, Anna Kendrick, Chris Pine, Tracey Ullman, Christine Baranski, and Johnny Depp. Directed by Rob Marshall. Rated PG for thematic elements, fantasy action and peril, and some suggestive material.